The sequel to the unique action-strategy hits your PC with tons enemies and gigantic bosses. 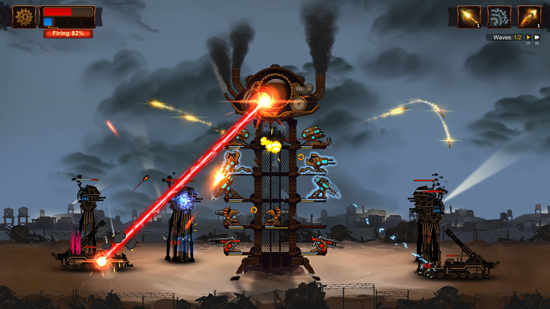 Steampunk Tower 2 is a Real Time Strategy game in which you will have to defend yourself from the attacks of powerful armoured enemies and tremendously huge bosses. Protect your troops with the help of your ultra-modern weapons and send your agents to external missions as you acquire extra resources for your team. “In Steampunk Tower 2 we’ve improved every single bit contained in the original Steampunk Tower”, says Maxim Ivanchenko, CEO at DreamGate. “We’ve made the turret navigation better, we’ve added new game modes, we’ve increased the number of levels, and we’ve created brand new visuals, among many other enhancements”. Steampunk Tower 2 will be appearing on iOS and Android in the very near future. The game contains more than 70 different levels and random generated levels, HD stylized graphics, 40 game modes and the scent of an instant classic. Dynamic battles! Each turret has its own specifics and its unique super shot. Stronger enemies! Enemies have acquired extra armour but their weak spots have also appeared. Test super weapons and special bonuses that will increase your chances of success in a battle. Humungous bosses! You can’t beat these steam monsters on the first try. Secret Steampunk city! Build scientific research laboratories, warehouses and factories for building new turrets. War for the territories! Control the factories to produce component parts for your turrets. Team of professionals! Send your agents on special missions to get extra resources. Many storyline missions throughout Europe! Find a way to defeat the enemy and get into the heart of enemy territory for the final stroke. Trains! Develop railway network for transportation of agents and resources. Can’t Steampunk be without trains? !